David McMillan is an associate in BakerHostetler’s litigation group, whose practice centers on data breach and consumer class action defense, bankruptcy litigation, and commercial contract disputes. 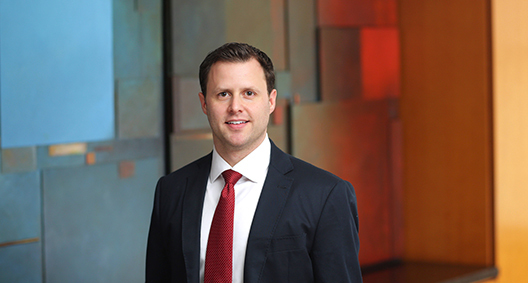 Representing clients across a range of industries, including technology, health care, hospitality and retail, David helps companies navigate the constantly-evolving realm of class action defense, working to develop and implement legal strategies to mitigate potentially devastating exposure. With particular expertise in cybersecurity litigation arising from email phishing scams and other types of social engineering, David has a keen understanding of the legal, strategic and cost considerations companies must examine when facing these types of suits. David also plays an integral role in BakerHostetler’s representation of the SIPA Trustee for the liquidation of Bernard L. Madoff Investment Securities LLC (BLMIS), helping to spearhead a multimillion-dollar clawback action as part of the Trustee’s global effort to trace and recover assets for Madoff's defrauded customers. David speaks frequently on current issues in class action law and contributes regularly to BakerHostetler’s Class Action Defense blog. He considers himself a strategy-driven, creative litigator who aims to deliver cost-effective and meaningful solutions for his clients. D­­efeated gross negligence and unjust enrichment claims lodged against web hosting service provider, arising from social engineering attack and alleged disclosure of sensitive information of millions of users of social networking website. Defend New York-based biotechnology company in putative class action stemming from phishing email scam leading to the inadvertent disclosure of W-2 forms for hundreds of company employees. Defended telemedicine triage service company providing mobile diabetic retinopathy examinations in putative class action asserting violations of the Telephone Consumer Protection Act. Filed motion to dismiss based on lack of standing, precipitating a favorable settlement for the client. Represent class of Colorado Medicaid enrollees in class action challenging Colorado Medicaid restrictions on coverage of Direct Acting Antiviral medications for chronic Hepatitis C. Obtained class certification, defeated a motion to dismiss and negotiated terms of settlement in which challenged restrictions were removed. Defended medical director of major pharmaceutical company in multimillion-dollar securities fraud class action, in which dismissal was obtained via summary judgment following Supreme Court’s decision in Halliburton. Represent Irving Picard, Trustee under the Securities Investor Protection Act for the liquidation of Bernard L. Madoff Investment Securities, as plaintiff in numerous bankruptcy avoidance actions seeking to recover multibillion-dollar losses for victims of Madoff’s Ponzi scheme. Represented former London-based JP Morgan managing director whose cooperation was sought in the investigation related to a multibillion-dollar trading loss for the bank. Helped secure rare nonprosecution agreement with U.S. Department of Justice and agreements with other regulatory authorities by providing valuable factual analyses and assessments regarding securities derivatives trading in JP Morgan’s Chief Investment Office. Represented indigent death-sentenced inmate in state and federal habeas corpus proceedings in Georgia. Represented rent-stabilized tenant in housing court proceedings to enforce repairs and to collect rent overcharges before the New York State Division of Housing and Community Renewal. Represented class of Colorado Medicaid enrollees in class action challenging the legality of Colorado Medicaid restrictions on coverage for Direct Acting Antiviral medications (DAAs) for Hepatitis C. DAAs have been labeled “breakthrough therapy” by the FDA and have been shown to result in a de facto cure for more than 90% of patients. Represented nonpartisan public policy research foundation in amicus brief before the U.S. Supreme Court in Pena v. Taylor Farms, arguing that courts should only certify class actions based on evidence that would otherwise be admissible at trial. Represented nonprofit organization dedicated to economic empowerment of African American communities in amicus brief before the U.S. Supreme Court in Campbell-Ewald Co. v. Gomez, a case with key implications for the ability of companies to defeat class actions using offers of judgment under Rule 68 of the Federal Rules of Civil Procedure. Represented nonpartisan public policy research foundation in amicus brief before the U.S. Supreme Court in Tyson Foods v. Bouaphakeo, which deals with the constitutional viability of “trial by formula” to determine liability and damages in wage-hour class actions.